Back in days of yore, yore being that time long ago when people actually darned socks, butchered their own animals, and didn’t fret needlessly over whether or not radiation from the Fukushima meltdown plant was actually seeping into their Gorton’s fish sticks, most distilleries in Scotland malted all their own barley (malting being the process of steeping grain in water until it begins to germinate and then halting the germination by drying the grain). Demand for Scotch is just a little higher today than it was in the mid to late 1800’s, and certain aspects of the supply chain may have changed a little as well. While there were commercial maltsters back then (Baird’s, Crisp, and Simpson’s for example, can all trace their beginnings back to the mid 1800’s), many distilleries were able to accommodate their malt needs by doing it all by themselves. As time marched on, the industrial revolution laid its rails and upped its efficiency, and the whisky industry grew and consolidated, and then grew some more; more and more distilleries realized it was easier, and more importantly, more profitable to have a large commercial maltster malt their barley. Floor maltings began to disappear, and today, there are only a handful of distilleries that continue to malt their own barley. Not counting the newish, large-scale, serving-multiple-distilleries, Diageo-Owned spirit factories of Roseisle and Glen Ord, the only old school distilleries that still turn their own barley are: Balvenie, BenRiach, Bowmore, Highland Park, Laphroaig, and Springbank with Islay’s new school Kilchoman also joining this established crowd. It’s very important to note that of those seven mentioned, only Springbank is able to malt its entire requirement, with the others only producing a minority percentage. The volume these companies are producing is just too great for their relatively small and antiquated maltings to keep pace. Even the relatively tiny Kilchoman (producing 140,000 litres of alcohol/year compared to, say, Balvenie’s 6,400,000 litres) malts just 30% of their requirement and gets the majority of their malt from Port Ellen. 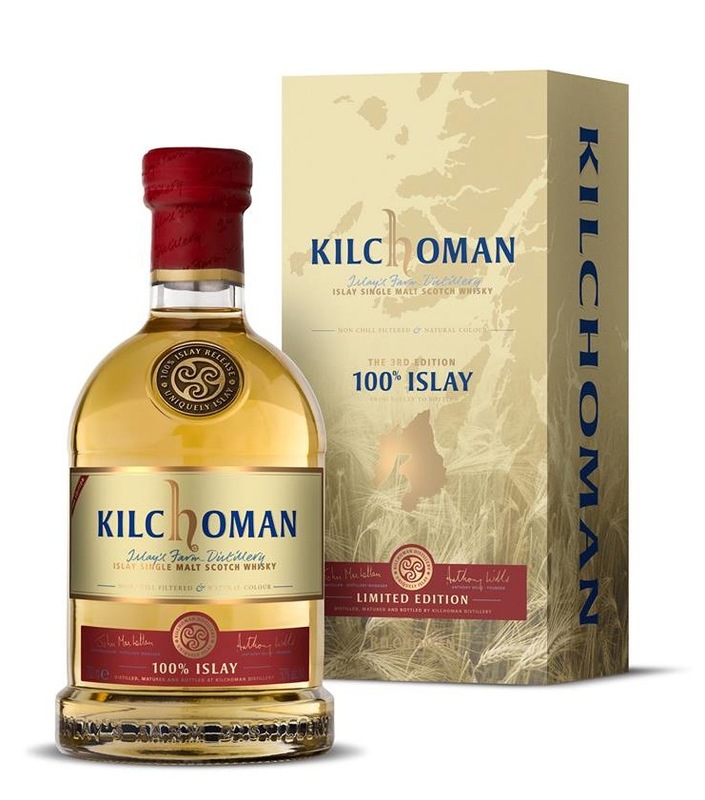 What sets Kilchoman apart somewhat from the others is that while they incorporate their own maltings with the commercially malted stuff for much of their output, they have also have a now yearly release that they call their 100% Islay expression. These are whiskies made from barley grown on the Kilchoman farm, malted on site, and mashed, distilled, matured, and bottled at the distillery as well. Granted, the glass bottle is most likely not made on Islay, but everything inside the bottle was produced right there at Kilchoman – a rare occurrence in this day and age. The third edition in the 100% Islay series was released in the summer of 2013 and is a mix of four year old and five year old whiskies all matured in new American white oak barrels. For those driven absolutely wild by such things as peat levels used, it may interest you to know that Kilchoman’s malt from Port Ellen is peated to approximately 50ppm (the phenols expressed as parts per million), and the malt from Kilchoman itself, peated to approximately 20ppm. The Nose: A very clean, fresh, inviting, absorbing nose with both complex fruit and peat notes. True to the Kilchoman style, lots of pear, both poached and crisp, barely-ripe Anjou, along with a bit of tart lemon curd and Meyer lemon pith. There’s also a floral honey sweetness here and touches of vanilla bean. The peat and smoke have a lighter, more integrated quality, almost like smelling fabric that’s been around peat smoke rather than the peat smoke itself. Tucked further back is a wisp of sea spray, bright cinnamon, a bit of rubbed tobacco leaf, and a faint hint of eucalyptus. 50% ABV isn’t too high a proof to enjoy this on its own. A bit of water brings out more peat and smoke, but also tones down some of the complex sweeter elements. The Palate: A nicely creamy mouthfeel shows off continued honeyed pear and citrus sweetness as well as much more sooty peat than was on the nose. Dark, fudgey chocolate with sea salt and smoked almonds lead to a nice swell of slightly ashy peat smoke, vanilla bean, peppercorns, green-ish clove, and a bit of that same, resinous eucalyptus from the nose. Water does very nice things here, drawing out all the flavors nicely and rounding off some of the sharper edges. The Finish: Long. A honey-roasted nuts quality fades quickly, but mingling peat, smoke, and lemon notes hang around for quite a while. Thoughts: Great stuff. At this point, the one thing you need to recognize about Kilchoman over the last couple of years is its remarkable, consistent quality even at such a young age. Of the three 100% Islay expressions so far, this is by far my favorite – the extra year of maturation has helped integrate everything better, and some of the rawer edges have been smoothed, especially those of the house-malted peat. There’s a great balance and progression of flavors here. This is a lighter whisky than the 2007 Vintage but it still stays true to this fledgling distillery’s house style. Definitely recommended. < Previous Obligatory April Fool’s Day Whisky Blog Post. Yet another superb read! How do you do it??? I’ve made the suggestion on numerous occasions. Maybe via a boozy milkshake! They love milkshakes.